His decision reflects mounting U.S. frustration with Pakistan over a growing list of disputes -- mirrored by Pakistani grievances with the U.S. -- that have soured relations and weakened security cooperation. The U.S. is withholding at least $3 billion in reimbursements for counterinsurgency operations and security-related funding, according to congressional aides and Pakistani officials. “We are reaching the limits of our patience, and for that reason it’s extremely important that Pakistan take action” to crack down on armed groups based there that attack American and coalition forces in Afghanistan, U.S. Defense Secretary Leon Panetta said yesterday in Kabul. In more than a dozen interviews, diplomats from both nations say they are trying to repair rifts that have sent relations to the lowest point in two decades, while military and intelligence officials are less sanguine about building trust. At stake are billions of dollars in U.S. funding for an ally in financial crisis, and American influence with a nuclear-armed power as U.S. forces pull out of neighboring Afghanistan. U.S. officials, who spoke yesterday on the condition of anonymity to discuss classified intelligence, said they expect Pakistan may order the CIA to stop using a remaining air base from which the officials say they have controlled Predators to target militants sheltered in Pakistan’s tribal areas bordering Afghanistan. Pakistani authorities today disputed the U.S. version of events, insisting that the CIA officers working on the drones program were expelled from all Pakistani air bases late last year. Predator strikes on targets in Pakistan’s tribal areas are being launched from bases in Afghanistan, according to two Pakistani national security officials who spoke on condition of anonymity because they weren’t authorized to speak. The U.S. conducted drone strikes from air bases inside Pakistan starting in 2004 with the tacit approval of authorities in Islamabad. The strikes became extremely unpopular in Pakistan, where politicians and the media denounce them as a violation of sovereignty that has claimed innocent bystanders. Pakistan’s parliament and leadership have demanded the U.S. cease the strikes entirely. Obama administration officials say opposition to the drones is an example of Pakistan’s unwillingness to cooperate and crack down on certain militant groups who they say have enjoyed protection from security forces. The White House and the Pentagon are so frustrated with the failure to reach a compromise on this and other issues -- such as frozen NATO supply lines to Afghanistan -- that the administration is prepared to accept Pakistan aid cuts pending in Congress and cultivate closer relations with India, Pakistan’s longtime rival, U.S. officials said. Pakistan has its own set of grievances with the U.S., and Panetta’s open scolding doesn’t help, said Pakistan’s Ambassador to Washington Sherry Rehman. Cooperation has been at a standstill for more than six months since Pakistan shut down NATO military supply routes to Afghanistan after U.S. forces accidentally killed 24 Pakistani border forces during a friendly fire incident in November. When U.S. officials privately agreed in February to Pakistan’s demands for a public apology, Pakistani officials asked them to wait until a parliamentary committee completed recommendations for a reset of relations, according to officials on both sides. By the time the review was completed two months later, a series of attacks in Afghanistan by Pakistan-based militants left U.S. officials furious and no longer willing to apologize, officials said on condition of anonymity. U.S. and Pakistani officials said they are trying to resolve the two most serious disagreements: the drone program and military supply routes. Most spoke on condition of anonymity to be candid about the tensions in an alliance that has fallen to its lowest point since 1990. That year, Congress banned most economic and military aid to Pakistan over its nuclear program, and the U.S. refused to deliver a fleet of F-16 aircraft for which Pakistan had paid nearly $500 million. In conversations last month, some officials on both sides hinted intelligence sharing might be possible to allow drone strikes to be conducted by the two countries in concert, and suggested a deal might be coming on supply lines. This week, no one expressed any optimism about a breakthrough on either issue -- or any quick resolution of many other disagreements. “This relationship is sinking, but has yet to reach the bottom,” said Bruce Riedel, a former CIA analyst who led a White House review of U.S. policy on Afghanistan and Pakistan when Obama first took office. Riedel, now a fellow at the Brookings Institution in Washington, said Pakistan is harboring three of the U.S.’s most- wanted terrorists: al-Qaeda leader Ayman al-Zawahiri; Afghan Taliban leader Mullah Omar; and Hafiz Saeed, the Lashkar-e-Taiba chief blamed for masterminding the 2008 attacks that killed 166 people in Mumbai. Panetta’s comments in Kabul -- and the fact that he did not seek a stop in Pakistan while visiting neighboring India and Afghanistan -- reflect U.S. officials’ frustration over what they say is an increasing flow of money, training and arms to the Pakistan-based Haqqani militant group, which has attacked American and allied personnel in Afghanistan. The U.S. is “extraordinarily dissatisfied” with Pakistan over the Haqqani network, U.S. Joint Chiefs of Staff Chairman Army General Martin Dempsey said yesterday at the Pentagon. 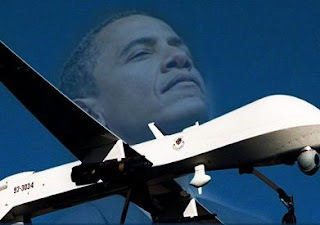 The Obama administration considers the drones a vital part of a counterterror campaign that protects both nations. U.S. officials said a strike this week killed al-Qaeda’s No. 2 leader, Abu Yahya al-Libi, in Pakistan’s North Waziristan area. The U.S. will continue the drone strikes from Pakistan -- as well as from neighboring Afghanistan -- for as long as it can, two U.S. officials said. Pakistani national security officials, who spoke on condition of anonymity, denied that Pakistan is aiding U.S. enemies. Two officials said if the U.S. has evidence that the Haqqanis maintain bases in Pakistan’s tribal areas, it should share that information so Pakistan can eliminate them. The Pakistani officials said the U.S. hasn’t done so and hasn’t been able to locate and use drones to destroy Haqqani bases in Pakistan, which they said undermines U.S. claims that Pakistan is actively sheltering insurgents. Pakistani security officials also said it’s insulting that Obama refused to meet with their president at the North Atlantic Treaty Organization summit in Chicago last month. U.S. officials, speaking on condition of anonymity, said they made clear that Obama would meet with President Asif Ali Zardari only if a deal was reached to reopen the NATO supply lines to Afghanistan before the Chicago summit. U.S. officials said they had Pakistani assurances that a deal was imminent, and the failure to close a deal before Zardari’s arrival was one more blow to Pakistan’s standing with the administration. The impasse over the NATO routes came after a series of other flash points last year, including the killing of two Pakistanis by a CIA contractor and the U.S. raid on al-Qaeda leader Osama bin Laden’s compound without informing Pakistani officials. U.S. officials said the supply-route talks are hung up because Pakistan is demanding more money than the U.S. is willing to pay to move cargo. Pakistan is also seeking U.S. funding for road repairs and other infrastructure rebuilding to compensate for wear and tear from NATO convoys, according to U.S. officials. Rehman said the issue is about “coming up with new frameworks of mutual cooperation,” not money. Pakistan is “looking for a face-saving” solution, Hasan- Askari Rizvi, an independent political and military analyst in Lahore, said in a telephone interview. The military, he said, “used to decide on foreign policy in the past. Now, they don’t want to take the blame,” and the civilian leadership is distracted and fears political criticism for making any concessions. In Washington, Congress is moving to cut aid and other payments to Pakistan. Pakistan was supposed to be the No. 3 recipient of U.S. foreign aid this fiscal year, though since last summer the administration hasn’t released more than $1 billion in security funding for fiscal years 2011 and 2012. Military aid was suspended following the uproar in Pakistan over the violation of its sovereignty by the U.S. raid that killed bin Laden in Abbottabad. Pakistan expelled U.S. military trainers and denied visas for U.S. officials. The U.S. acknowledges it hasn’t paid Pakistan more than $1 billion in counterinsurgency reimbursements owed since December 2010. Pakistan says that tab has now grown to almost $3 billion. Meanwhile, the Senate Appropriations Committee last month voted to cut by two-thirds the administration’s request for more than $2.2 billion in foreign aid to Pakistan for fiscal year 2013, said Alan Kronstadt, a Pakistan specialist at the non- partisan Congressional Research Service. The full House voted to block counterinsurgency reimbursements until NATO supply lines are reopened, cap the total amount of reimbursements and condition payments on proven counterterrorism cooperation, he said. ,” halted this week following fraud allegations against the puppet theater that produces the show. The group denies the charges and an investigation is under way. “Relations are at the worst level ever and appear to be deadlocked right now -- and it’s not likely to get better any time soon,” said Brian Katulis, a foreign policy adviser to the Obama re-election campaign and a Pakistan specialist at the Center for American Progress in Washington. Complicating matters, it’s an election year in both nations, and neither government wants to be seen as “soft,” given public opinion. Husain Haqqani, Pakistan’s former ambassador to Washington, calls the core problem one of conflicting narratives.